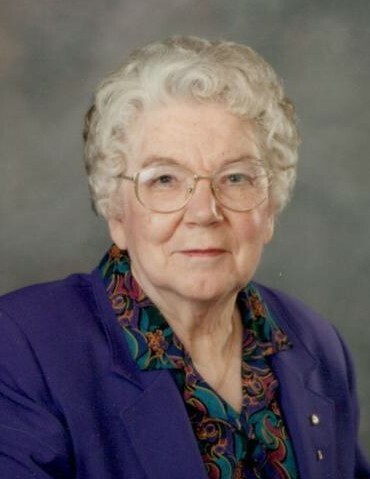 Gene Sara Moen (nee Holaday), age 92, passed away peacefully with family by her side on Saturday, April 6, 2019 at the Meadows in Swift Current, SK. Gene was born on April 13, 1926 to Elza & Miriam Holaday in Watrous, SK. She grew up in the Ketchen and Hazel Dell area, and attended Moose Jaw Normal School to obtain her teaching certificate. Gene taught at Hovdestad, Prosperous Valley, and Leonard school. She married the love of her life, Orville Moen, on July 28, 1951 and their daughter, Laurie was born in 1957. Gene enjoyed gardening, knitting, and sewing. She was kind, generous, and always welcomed everyone, making them feel special. Gene was a good baker and a great hostess. Gene was predeceased by her husband, Orville (1979); her parents, Elza & Miriam; her siblings, Jim, Marie, and John (Regina); her niece, Denise Duke; her parents-in-law, Julius & Ruth Moen; and by her brothers and sisters-in-law, James, Bennie, Raymond, Ruth Moen, Mabel (Ralph) Rindahl, Clarine (John) Furseth, Gertie (Oscar) Johnson, and Muriel (Clinton) Pederson. Left to cherish Gene’s memory is her daughter, Laurie (Frank) Glenn; her grandsons, Casey and Logan Schultz, and Justin and Byron Glenn; her great-grandsons, Eric and Jayse; her sisters and brothers-in-law, Ellen (Murray) Palmer, Agnes (Lester) Millang, Edith (Wally) Kononoff, Harold (Renetta) Moen, and Gladys Moen; and by numerous nieces, nephews, great-nieces and nephews, great-great-nieces and nephews. The Funeral Service was held on Saturday, April 13, 2019 at 1:30 pm from the Church of the Open Bible, Swift Current, SK with Rev. Jason Johnson officiating. “In The Garden,” “How Great Thou Art,” and “I’ll Fly Away” were sung by the congregation, with Barb Klassen serving as pianist. The eulogy was read by Laurie Glenn and family. Special music was brought by Dale Holaday as vocalist and Loree Ann Graham accompanying him on the piano. The ushers in the church were Garth Palmer and Myron Furseth. The Private Family Interment was held at Memory Gardens Cemetery, Swift Current, SK with Gerald Holaday, Kerry Holaday, Dale Holaday, Ron Holaday, Andrew Furseth, and Mark Carlson serving as pallbearers. In memory of Gene Moen, donations to Saskatchewan 4-H Foundation would be appreciated by the family.